New Zealand’s first game of football played by the rules laid down at Rugby School was between a Nelson club team and Nelson College in May 1870. 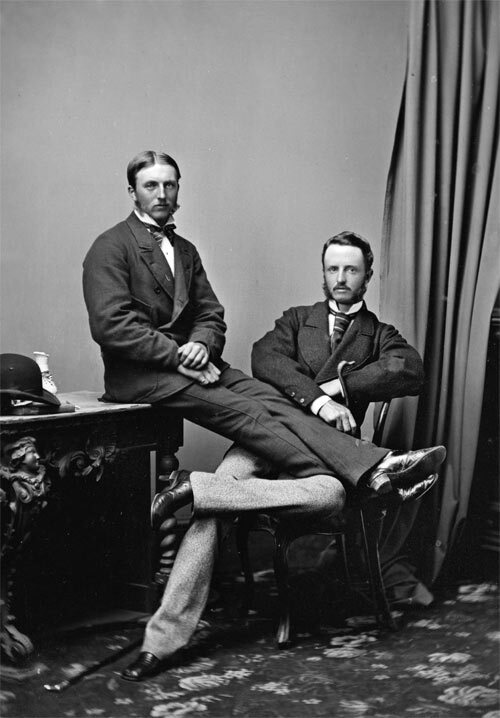 The man responsible for providing the rules and persuading the teams to play by the code was Charles John Monro (pictured here, left, in 1874 with his brother Aleck). Charles Monro was born on 5 April 1851 at Beacroft homestead, Waimea West, near Nelson. He was the fifth child of David and Dinah Monro. His father became a leading politician who served on the Nelson Provincial Council and as Speaker of the House of Representatives and was knighted in 1866. Charles went to Nelson College from 1863 to 1865, and in 1867 he left for England to be educated for a career in the army. For two years he attended Christ’s College at Finchley, near London. The school played football according to Rugby School rules, and Charles played for the second team (out of three). Abandoning his army ambitions, Monro returned to Nelson in January 1870 and joined the Nelson Football Club, which had been formed two years before. Football was being played in a number of schools and communities at the time, and was usually a hybrid game mixing association football and Australian rules, featuring a varied number of players and games of an indeterminate length. Monro persuaded the Nelson club to try out the Rugby School rules. The club approached the headmaster of Nelson College, the Reverend Frank Simmons, himself a graduate of Rugby School, and he agreed that the school would also adopt the game. Monro helped coach their players. With two teams conversant with rugby rules, a match was arranged on Saturday 14 May 1870 at the Observation Hill reserve. Each team had 18 players, and Monro played for the town club which won by two goals to nil. Sir David and Lady Monro were among the 200 spectators. The Nelson club had ambitions for wider contests and invited Monro to arrange a game with a Wellington team. He cobbled together a team there largely drawn from old boys of English public schools, and then drew on the influence of Colonial Treasurer Julius Vogel to have the Nelson team brought across on the government steamer. There were difficulties finding a suitable ground, but a flat area at Petone served the purpose. At the game, on 12 September 1870, there were few spectators and Nelson won easily – but this was the beginning of annual contests between Nelson and Wellington. Monro continued to play rugby until 1875, by which time the rules had spread widely to other parts of the country. In March 1871 in Nelson Charles Monro also took part in the first game of polo played in New Zealand. During the 1870s and 1880s Charles lived a varied and unsettled life. He spent time in the North Island looking for land, and made two long trips to England and continental Europe. In 1885 he married Helen (‘Lena’) Macdonald, daughter of a Nelson bank manager, and in 1889 he purchased land at Fitzherbert, across the Manawatū River from Palmerston North. There he built a large house, Craiglockhart, and had five children. Charles was a gentleman of means, inherited from his father. At Craiglockhart he had a large garden and orchard, investments in town sections, farms and local ventures such as flax mills. He was active in the local A & P show and the horticultural society, and was president of the national Game Club in 1908. Monro was a founding member and president of the Manawatu Golf Club, retained his enthusiasm as a spectator for polo, played croquet at Craiglockhart and enjoyed billiards and snooker at the Manawatu Club, of which he became president in 1896 and a life member in 1929. He does not seem to have retained a special interest in rugby, but he did attend the first international game in New Zealand, at Athletic Park in 1904 between New Zealand and Great Britain. It was not until 1928 that Monro’s crucial role in establishing the game in New Zealand was recognised. Charles Monro died on 9 April 1933, aged 82. Eleven years later Craiglockhart was sold to Massey Agricultural College. A memorial to Monro was put up on a hill overlooking the campus in 1970. The Nelson site of the first game under rugby rules is also marked. There is a statue of Monro in Palmerston North in front of Te Manawa, which houses the New Zealand Rugby Museum.